High Wycombe, October 2013 – Instron is pleased to confirm their attendance at the Advanced Engineering Show on the 12th and 13th November in Birmingham. Containing dedicated composites, aerospace, and automotive focused halls, the exhibition provides the ideal platform for Instron to showcase their expertise in the area of advanced materials testing systems and associated Professional Services dedicated to the growing composites market. 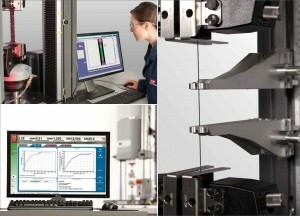 Visitors at the Instron booth(D91 of the Aero Engineering Hall) will be able to view an Instron 5969 dual column table top universal testing system equipped with a non-contacting video extensometer (AVE), which leverages the capabilities of the newly developed DIC Replay Software package. Digital Image Correlation (DIC) is an optical technique comparing images of a stressed specimen’s surface to generate full field strain and displacement maps. A second highlight will be an ElectroPuls™ E1000 test instrument, a state-of-the-art electro-dynamic system for fatigue and static testing of materials and components, equipped with Specimen Self-Heating Control (SSHC) to optimise fatigue test duration. This innovative software feature enables tests to be run at maximum frequency without exceeding a pre-defined temperature limit. Instron will also be showcasing the advantages of the new Automatic Contacting Extensometer AutoX750 in terms of precision and ease of handling. A combination of hardware and software, DIC is designed to optically detect strain and displacement within a defined specimen or component surface area, whilst Instron’s AVE supplies the image and calibration data. The associated, independently running DIC Replay-Software provides visualization on a computer screen and also saves the data at an adjustable rate of up to 50 Hz in the form of individual images for post processing analysis. Compared to traditional strain measurement, this technology provides numerous benefits including the documentation of discontinuous strain, localised necking, and more. DIC also enables the visualization of the side profile of flat bending or compression specimens and the detection of strains and displacements in cases where conventional extensometers are impractical. 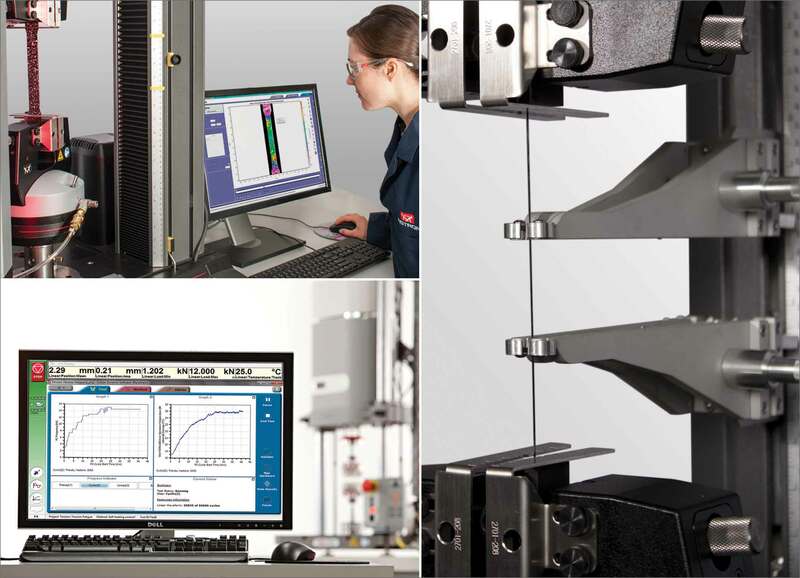 SSHC is a new add-on to the versatile Instron® WaveMatrix™ Dynamic Testing Software package used for fatigue testing of polymers, composites, and other materials. By automatically adjusting the test frequency, it maintains specimen temperature within a tight band and can save time, cost, and energy in the test lab. To achieve this, the add-on uses the difference between the specimen’s continuously recorded temperature and a pre-specified temperature target to maximize the testing frequency in a closed loop. Lower loadings result in less heating and very large numbers of cycles-to-failure, so the system can run at a significantly higher frequency, which greatly reduces the test duration. By contrast, at high loading, frequency is reduced, ensuring consistent specimen temperature is maintained even in the latter stages of the test, during which self-heating effects increase dramatically resulting in run-away specimen temperature with fixed frequency tests. Instron’s AutoX750 supports faster, more reliable and more precise materials testing. Its high accuracy of +/-1 µm, along with a maximum travel of 750 mm and multiple knife edge options make it an ideal extensometer for tensile, flexure, and compression testing of various materials including highly-rigid composites, metals, and plastics. With features including automatic gauge length positioning and automatic attachment to the test specimen with adjustable contact force, the AutoX750 can enhance the productivity of testing laboratories. By removing tedious and time-consuming manual steps, lab operators can enjoy a simplified testing routine while improving throughput. Reducing inconsistencies in how a traditional clip-on extensometer is attached greatly improves the repeatability and reproducibility of critical test results. Instron Professional Services will be available at the event to discuss the requirements needed to succeed with Nadcap approval. Working directly with Nadcap and ASTM to understand the requirements for alignment, Instron can provide the professional services that help a business to meet those requirements and remove the complexity. The Instron Nadcap service package covers alignment assessment of the load string in a testing frame, and is carried out on-site by factory-trained and qualified engineers who can verify Instron material testing systems to the appropriate Nadcap standard.